Happy Monday, friends! 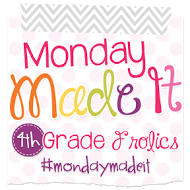 I am so excited today because I am hosting Monday Made It over at Fourth Grade Frolics! Head over there now to see some of the fun things I whipped up this past week! And...once you're there, make sure and check out some of the other fantastic bloggers who linked up.